Nevus anemicus is a congenital vascular anomaly that presents clinically as a hypopigmented macule or patch, as shown below. The lesional pallor is due to a localized hypersensitivity to catecholamines with resultant vasoconstriction. Nevus anemicus is an uncommon disorder and was first described by Vorner in 1906. Irregularly shaped, well-demarcated, asymptomatic hypopigmented patch of nevus anemicus on the lateral leg. Intralesional injection of bradykinin, acetylcholine, serotonin, nicotine, 5-hydroxytryptamine, and histamine fails to induce the anticipated vasodilatation or erythema in the affected area. However, erythema does follow an axillary sympathetic block of the involved limb or intradermal injection of the alpha-adrenergic blocking agent, pilocarpine. These findings suggest that nevus anemicus is best termed a pharmacologic nevus resulting from increased vascular sensitivity to catecholamines. This conclusion is further supported by autograft exchange transplantation studies that show donor site dominance. It also has been proposed that an abnormality in endothelial adhesion molecule induction (E selectin expression) may be involved, suggesting several pharmacologic anomalies are involved and further supporting the idea that nevus anemicus may best be termed a pharmacologic nevus. 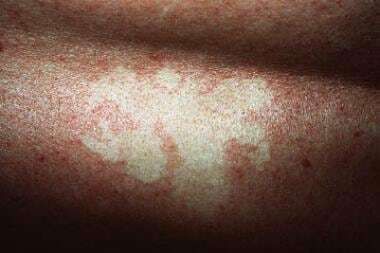 Nevus anemicus is due to a congenital anomaly of the cutaneous vasculature resulting in hypersensitivity to catecholamines, leading to localized vasoconstriction. No racial predilection has been noted in the literature for nevus anemicus. Nevus anemicus may be present at birth or first appreciated in early childhood. Greaves MW, Birkett D, Johnson C. Nevus anemicus: a unique catecholamine-dependent nevus. Arch Dermatol. 1970 Aug. 102(2):172-6. [Medline]. Marque M, Roubertie A, Jaussent A, Carneiro M, Meunier L, Guillot B, et al. Nevus anemicus in neurofibromatosis type 1: a potential new diagnostic criterion. J Am Acad Dermatol. 2013 Nov. 69(5):768-75. [Medline]. Hernández-Martín A, García-Martínez FJ, Duat A, López-Martín I, Noguera-Morel L, Torrelo A. Nevus anemicus: a distinctive cutaneous finding in neurofibromatosis type 1. Pediatr Dermatol. 2015 May-Jun. 32 (3):342-7. [Medline]. Ferrari F, Masurel A, Olivier-Faivre L, Vabres P. Juvenile xanthogranuloma and nevus anemicus in the diagnosis of neurofibromatosis type 1. JAMA Dermatol. 2014 Jan. 150(1):42-6. [Medline]. Ruggieri M, Polizzi A, Strano S, Schepis C, Morano M, Belfiore G, et al. Mixed vascular nevus syndrome: a report of four new cases and a literature review. Quant Imaging Med Surg. 2016 Oct. 6(5):515-524. [Medline]. [Guideline] Ahkami RN, Schwartz RA. Nevus anemicus. Dermatology. 1999. 198(4):327-9. [Medline]. Castori M, Rinaldi R, Angelo C, Zambruno G, Grammatico P, Happle R. Phacomatosis cesioflammea with unilateral lipohypoplasia. Am J Med Genet A. 2008 Feb 15. 146A(4):492-5. [Medline]. Tran HV, Zografos L. Primary choroidal melanoma in phakomatosis pigmentovascularis IIa. Ophthalmology. 2005 Jul. 112(7):1232-5. [Medline]. The authors and editors of Medscape Reference gratefully acknowledge the contributions of previous author, Theresa G. Knoepp, MD, to the development and writing of this article.